Natural selection changes allelic frequencies; the direction and magnitude of change depends on the intensity of selection, the dominance relations of the alleles, and the allelic frequencies. Directional selection favors one allele over another and eventually leads to fixation of the favored allele. Overdominance leads to a stable equilibrium with maintenance of both alleles in the population. Underdominance produces an unstable equilibrium because the heterozygote has lower fitness than those of the two homozygotes. 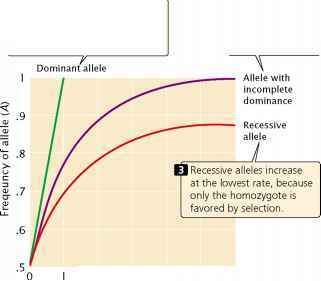 I Dominant alleles increase rapidly through selection because both the homozygote and the heterozygote are favored. ^ With incomplete dominance, the allele increases at a lower rate. 423.16 The rate of change in allelic frequency due to selection depends on the dominance relations among the genotypes. Here, change in the frequency of an allele is shown for different types of dominance with a constant selection coefficient. frequency of the A2 allele will decrease over time (because the A2A2 homozygote produces no offspring), and the rate of decrease will be proportional to the frequency of the recessive allele. When the frequency of the allele is high, the change in each generation is relatively large but, as the frequency of the allele drops, a higher proportion of the alleles are in the heterozygous genotypes, where they are immune to the action of natural selection (the heterozygotes have the same phenotype as the favored homozygote). Thus, selection against a rare recessive allele is very inefficient and its removal from the population is slow. The relation between the frequency of a recessive allele and its rate of change under natural selection has an important implication. Some people believe that the medical treatment of patients with rare recessive diseases will cause the disease gene to increase, eventually leading to degeneration of the human gene pool. This mistaken belief was the basis of eugenic laws that were passed in the early part of the twentieth century prohibiting the marriage of persons with certain genetic conditions and allowing the involuntary sterilization of others. However, most copies of rare recessive alleles are present in heterozygotes, and selection against the homozygotes will have little effect on the frequency of a recessive allele. Thus whether the homozygotes reproduce or not has little effect on the frequency of the disorder. Mutation and natural selection Recurrent mutation and natural selection act as opposing forces on detrimental alleles; mutation increases their frequency and natural selection decreases their frequency. Eventually, these two forces reach an equilibrium, in which the number of alleles added by mutation is balanced by the number of alleles removed by selection. Achondroplasia (discussed in Chapter 17) is a common type of human dwarfism that results from a dominant gene. People with this condition are fertile, although they produce only about 74% as many children as are produced by people without achondroplasia. 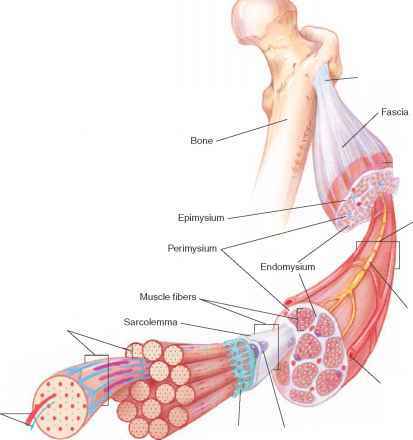 The fitness of people with achon-droplasia therefore averages .74, and the selection coefficient (s) is 1 — W or .26. If we assume that the mutation rate for achondroplasia is about 3 X 10—5 (a typical mutation rate in humans), then we can predict that the equilibrium frequency for the achondroplasia allele will be if _ (.00003/.26) _ .0001153. This frequency is close to the actual frequency of the disease.